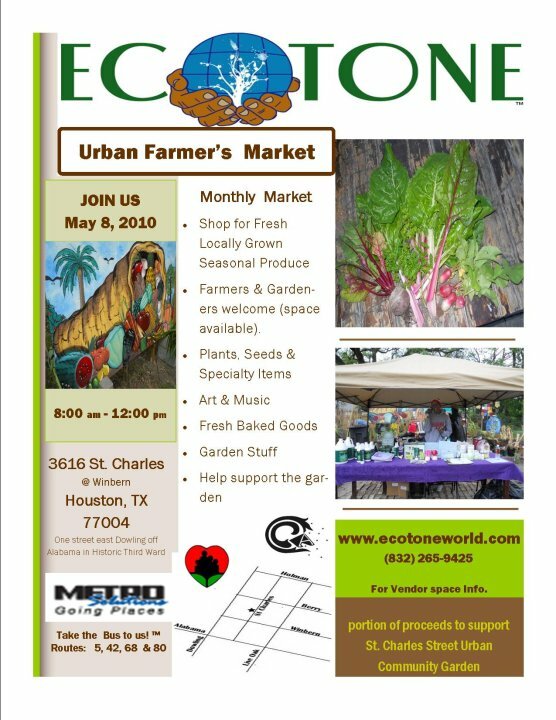 On this saturday from 8-12 Houstons' ecotoneurban farm will host a farmers market. As a community one of the best ways to go back to our original/ indigenous way and take back our power from big businessis to support local farmers markets (and even better support our black owned farmers markets). Ecotone urban farm is located on the corner of st charles and holman street. This farm is a black owned non-profit organizationthat i volunteer for and regularly collaborate with. It was started by a lady Named Chef Tarsha who is in collbaroation with Deloyd Parker's shape community center to bring life back to houstons 3rd ward area and supply the community with freshnorganic produce either for free or at a much cheaper price than buying out of stores. if you volunteer youre able to pick a fresh sack of vegetables and take them home. If you visit our farmers markets the organic produce is much more fresh becasue its locally grown and cheaper than purchasing organic vegetables out of wholefoods or any other store. This will take money and power away from big business and place it back in the hands of everyday people and most importantly the people right around you in your own neighborhood. taking on endevors such as this will do a great deal to make our communities more self sufficient and self-sustaining, take us back to our original way of life before we turned all of our power over to big business and the government. it will bring back the bartering system which our ancestors survived on for thousands of years long before money became a supposed "nessesity"